He stopped nose to the ground like my hunting dogs used to do. The he followed a scent or some movement. 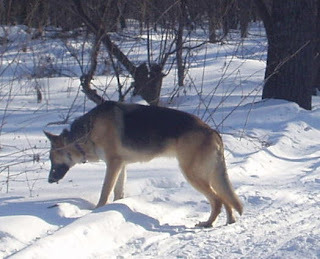 He was tracking something under the snow. GSD's are famous as "sniffer dogs." Rooting out explosives, illicit drugs etc. Today, we went for a "birding" hike in Lake Louise State Park. He tracked and flushed a pheasant, and then a huge turkey out of the slough. Hmmm. Maybe I should take up hunting for upland game again? Nah! No decision is actually needed in this case. Trout season doesn't open for a little more than a week. Still, I've been thinking "deep thoughts" about both hobbies. They are very similar actually. To be successful you need to be very observant. Close to nature works best. 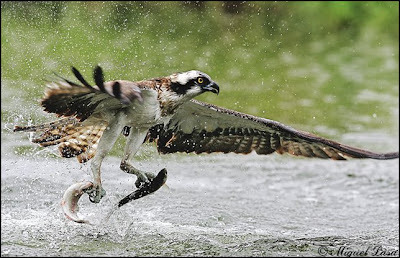 The best trout fishing is invariably away from the crowd. Birding too. In often the most beautiful of places. Crowds of people might work once in a while for birding but I suspect solitary or with one other person is also the best just like troutfishing. You need to be quiet. They both require a type of stalking. Trout fishermen are often accused of being the "elitist" types. When the sport was invented in England that was probably true. Trout streams were the private property of the landed aristocracy. Birders sometime's get charged with incipient "dweeb or geekism." It's easy enough to get involved in the minutia of either sport. Should I get technical about hatches and gear or binoculars and minute differences in color? Tell how to "read the water" or recognize bird songs. 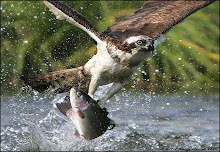 The point is that the birder or the trout fisherman is out and about amongst nature. What could be better than that? Then there are the stories that come with each hobby. Like the time I caught a bat who was attracted to my homemade fly. Or the time I was trapped against a cliff in Yellowstone while two testosterone crazed elk had it out right in front of me. Or the time that Tony and I were hiking,flyrod in hand, up a steep trail in the Bitterroots and came upon my first and only Great Grey Owl, who was drowsing on a branch of a Ponderosa Pine right above our heads. The tendency and the need to place close attention to things and the time to contemplate about them is why trout fishing has produced the only real "literature" in the fishing genre. I mean, what are you going write about thats really interesting with a $70,000 dollar bass boat, 3 guys on a polluted river and 2 cases of beer? What is truly appealing about both of these sports? A number of years ago, a Justice of the Supreme Court of Michigan , who wrote a best selling novel (Anatomy of a Murder), which later became a movie starring Jimmy Stewart, answered that question in a way of which I've always liked. Although it's about trout fishing I think it easily applies to birding as well. It was a sight I have waited thirty-eight years to see....a mature Bald Eagle in the field adjacent to my back yard. 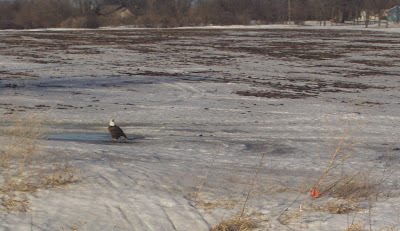 The eagle was sitting next to a puddle of water less than 100 yards from my door. 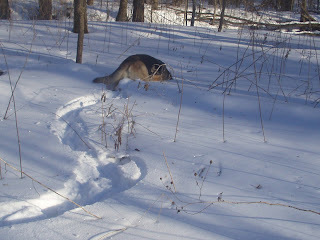 Futher investigation showed that the melting snow had revealed a deer carcass. Voila! Chow time for our national symbol. Late 1950's - I bought my first canoe for fishing trips down the beautiful St Croix river and into the BWCA. 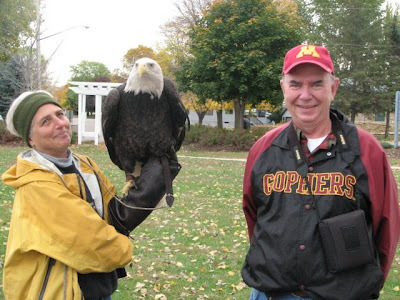 When the eagles disappeared from the St. Croix Valley, it happened in such a way we didn't really notice it at first. Their were still a few eagles in the BWCA and the Superior National Forest. Then I read Silent Spring.... and noticed. The Clean Air and Water Act, the EPA, the banning of DDT and an Endangered Species list followed and began to turn the tide. Finally then we gradually saw them return to the St Croix. 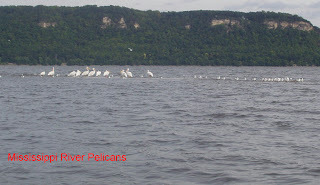 Increasing numbers were wintering in the Mississippi River Valley. And then they began to appear here in Fillmore County, about sixty miles from the Big River. 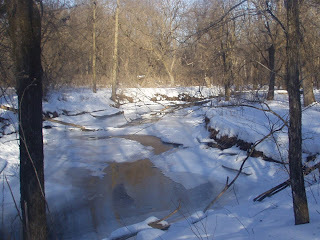 I began to see more and more on my trouting days along the streams of Bluff County. Then maybe 15 years ago the first nesting was spotted here on a canoe trip down Bear Creek. Now birds are overwintering here as well. Today there was a mighty eagle sitting confidently in the field behind my house. Wonderful! 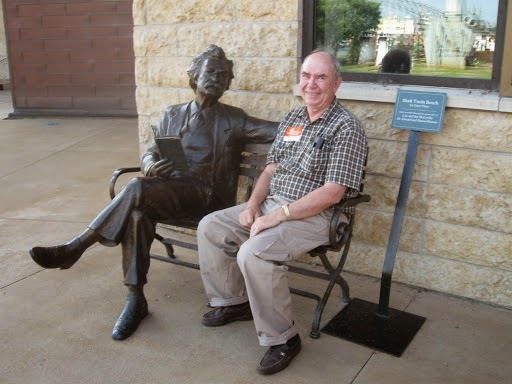 I had decided to rev up my new birding hobby by persuading my friend Mr. Science to join me at the National Eagle Center in Wabasha for the annual Golden Eagle Count. To my surprise, Golden Eagles are found wintering here in the Mississippi Valley. Unfortunately, he couldn't make it, so we decided to branch out on our own the following Friday. We stopped by the Eagle Center to get some ideas on routes to take where we might see the Goldens. There were learned that sixty Goldens had been spotted, the previous weekend, in Minn. Iowa, and Wisconsin . On to Wisconsin!! We made a waystop near Reeds landing where we spotted six Balds and a host of the usual waterfowl including common goldeneyes and Canada geese. Then it was across the Wabasha Bridge over The Big River and south towards Alma. We turned left and headed into the coulee country east of Alma. There we spotted perhaps another half of a dozen Balds in the next couple of hours before we started thinking about lunch. "Where should we go," I asked somewhat naively. "Hey every little town in Wisconsin has at least one bar," I was informed. So there ahead in the distance appeared to be a small crossroads. As we approached the town's outskirts, I noticed some buildings and a fence line stretching toward the east. "There's a huge flock of crows in the trees on that fence line up ahead," I pointed out . As we approached, the "crows" seemed to be growing in size. Stopping, we got out and scanned with our binocs. They were definitely Balds and my partner began counting till he reached over fifty. It was then that I noticed what appeared to be a hog confinement building along the road ahead of us. There were also some eagles on the ground in the alfalfa field behind the buildings and adjacent to the fence.We decided to approach closer by pulling the car ahead about a hundred yards. Now we could see clearly behind the building. There were dozens of Balds on the ground, some in a literal pile, where they were swarming and jumping in the air. This reminded me of one of those African documentaries where you see vultures clambering on the dead carcass of an antelope. We also spotted two birds on the ground somewhat separated from the others that we thought might be Goldens. In the half hour we watched this amazing sight, they never took flight, so we were unable to confirm their identity.Finally, we left drove ahead into town to find (sure enough) a bar and grill. We had lunch with a view, including watching eagles flying back and forth across the highway and roosting in a churchyard next to the bar. . Upon asking our waitress if seeing so many eagles here was a common sight, she informed us that they were "here all winter due to the chicken farm." I am sure there were at least over a hundred eagles in the immediate area. "What an amazing day!" Two young men of intense and immeasurable worth. Of her she gave the best to them and also as my wife. That they have their heaven on earth as I had my time. hitched up with a raw rookie like me? the little ones to the right," he asked. right. Caspian terns are what they are." Even Mr. Science was amazed.